ST. LOUIS - While Sunday’s Presidential Debate was held a few miles up the road, Webster University’s presence was made known behind the scenes. More than a dozen Webster University students and faculty worked with media to help them report on the event. The most active Webster representatives were management/marketing student Megan Price and education/history student Katie Lade. They spent most of their Sunday in “Spin Alley,” the room specifically reserved for media interviews before and after the debate. Both were asked to work the room because of previous volunteer work they did for the Hillary Clinton campaign. 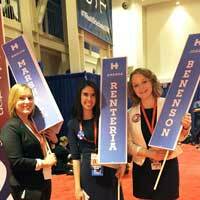 “As Spin Alley volunteers, we were assigned to surrogates whom we held tall signs for throughout the night to notify media where they were located amongst the chaos for interviews. My surrogate was Mr. Joel Benenson, Hillary’s campaign chief strategist and pollster, and Katie’s was Marlon Marshall (who is responsible for Clinton’s outreach to civil rights organizations). “During the time directly after the debate we were caught in a lot of hassle due to the fact that Mr. Trump considered going to the spin room. Secret Service was extremely diligent to secure the room, which caused chaos for media as well as the spin volunteers. The many conflicting interest of all parties made for a lot of stress, but I am happy to report Katie and I fulfilled our jobs well! The event was thoroughly intense and I was able to witness behind the scenes of the debate as I watched many famous journalists and anchors in action. They weren’t the only students at the debate location. Five School of Communications students and four faculty members received a private tour of the Presidential Debate Site Saturday night, courtesy of C-SPAN and Charter Communications. School of Communications faculty members Tom Serfass, Eileen Solomon, Gina Jensen and Scott Jensen, and students Jessica Karins, Angela Meng, MacLain Naumann, Brian Ruth, and Brooke Villhard all participated. After the tour, Naumann was interviewed by KSDK about the excitement around the debate and what he saw during the tour. Sister Jan Hayes, School of Communications, was on the Martin Kilcoyne show on KTRS (550 AM) Friday morning to discuss the ethics being used in the current Presidential election. Her interview can be found online at www.ktrs.com/sister-jan-talked-about-debate-procedure/ in the first hour of the Oct. 7 show. Hayes previously was on FOX 2 to discuss the issue of plagiarism in national politics after it was revealed that Melania Trump had copied most of a speech previously delivered by First Lady Michelle Obama. The day after the debate, Gina Jensen was interviewed by FOX 2 news to discuss who had the best performance. Jensen previously was interviewed on the same subject for the first debate. There are many on campus who have been involved in the campaign since the start of the semester, from students who have helped the community register to vote (http://fox2now.com/2016/09/27/voters-begin-casting-absentee-ballots-for-president-in-missouri/), to students working with national media on election coverage (http://college.usatoday.com/2016/09/27/we-asked-college-newspaper-editors-for-reactions-to-the-first-clinton-trump-debate-heres-what-they-told-us/). For more information about election activities on campus, visit www.webster.edu/campus-life/vote/.